Giving a meaningful and motivational graduation speech is a big responsibility. This is your chance to inspire hundreds, maybe even thousands of individuals to move confidently into the next leg of their lives. Being selected as a commencement speaker is a great recognition, but the responsibility can be intimidating. How do you know what kind of message will hit home for the graduates at this point in their lives? How do you make your message stand out from other words of wisdom that the graduating class has heard before? Fortunately, there are many incredible graduation speeches from which you can pull information. We’ve gathered 15 of the best graduation speech examples here to make your research and brainstorming process easier. A little studying can give you ideas for the perfect graduation speech topic and help you write your speech efficiently. Take note of the flow and structure of the examples, and let them guide you in creating your own graduation speech outline. Remember to practice your speech and memorize the bulk of it so you’re able to deliver with confidence. With a strong theme and plenty of practice, you’re sure to gain the audience’s attention and leave them inspired. Here are 15 free graduation speech examples to gain inspiration from. If you like a style or message of a sample speech, use it as a model to create your own original version. This valedictorian entertains the audience of his high school graduation speech with subtle, kind-hearted jokes that reflect the graduating class and the school faculty. The graduation speaker has a sentimental theme to his speech, but his light humor ensures that the presentation is both meaningful and memorable. You don’t have to be a famous comedian to deliver a funny graduation speech, but let Conan O’Brien’s speech at Dartmouth College serve as a good model to create your own. Intertwining life advice and great jokes, O’Brien inspires graduates to get past failure and pave their own paths. This preschool graduation speech is a great example for teachers who need to give a commencement address. A speech for a preschool or kindergarten graduation is different, in that the speaker is mostly communicating to the parents of the graduates. This preschool teacher delivers a meaningful speech that explains the joy in her job, while touching on the humorous things the students have said over the months. In what is recognized as one of the best graduation speeches of all time, David Foster Wallace affirms to a class of liberal arts students that their education taught them how to think and how to be self-aware. A class president delivers a heartwarming message in a storytelling format at his middle school graduation ceremony. Steven Levitan, creator of the award-winning show “Modern Family,” was the commencement speaker at the University of Wisconsin-Madison for the graduating class of 2017. This is a good example to follow if you’re an alum of the college you’re presenting to. Successful people are often chosen as commencement speakers for university graduation ceremonies. See how the CEO and founder of Facebook is able to portray humility in relating to the 2017 graduating class at Harvard University. Upon receiving his doctorate degree of humane letters, the “Today Show” weather anchor delivered an inspirational speech to the graduating class. Roker speaks to the class’s generation and relates his graduation speech topic back to his own upbringing. The Apple CEO’s commencement speech at 2005 to the graduating class at Stanford University is one of the classics. Jobs tells stories about his own experiences with dropping out of college, being fired from Apple, and being diagnosed with cancer. This fifth-grade class speaker relates her teacher’s message to a lesson from her grandfather as her opening hook. “To survive the fifth grade is not barely making it through. Instead, to survive means to perform with distinction. The famous talk show host and comedian Ellen Degeneres’s commencement speech at Tulane University is a great example of how a guest speaker can identify with her audience. Rear Admiral William H. McRaven aims to inspire his audience right from the beginning. The rear admiral encourages the graduating class to change the world, relating everyday life struggles to those of the people in the military. Oscar-winning actor Matthew McConaughey drew from his own personal story to deliver an inspirational commencement speech at the University of Houston. McConaughey gives the graduating class 13 life lessons, including to define success for yourself and find joy in your work. In his commencement address at Maharishi University of Management, actor Jim Carrey tells an emotional personal story. Carrey uses emotion to encourage the graduating class to walk their own path and never settle in life. The famous comedian delivers a witty and funny graduation speech, offering students practical advice for the real world. In this remarkable graduation speech, the class valedictorian makes a political statement by publicly revealing her status as an undocumented immigrant. The speech starts out with jokes, but turns into a moving performance that’s as powerful as it is fun to watch. This class-elected graduation speaker has the perfect delivery of well-crafted jokes and one-liners throughout her speech. She keeps the whole class laughing and never misses a beat. This college graduation speech educates listeners about women’s education through the eyes of the speaker, who encountered resistance to seeking an education just because she was a woman. It’s nearly impossible to listen to this speech without feeling moved to take action. This graduation speech by the senior class president is humorous and engaging. The class president reminisces with plenty of jokes in a speech full of fun memories and just the right amount of inspiration. Graduation ceremonies can be long, but the speeches don’t have to be. This short graduation speech uses an “ABCs of life” format to pack a lot of power into a short amount of time. The class president gets wild applause from the audience for his quick but clever speech. Thank teachers and your parents or other family members for their support, encouragement, help, aid or personal assistance during your years of studying. Praise accomplishments and achievements of the class. Reflect upon the past years, what has changed and is interesting enough to share with all? Mention funny and exciting events, you can opt for funny oneliners or even small innocent jokes, poems or quotations from famous people if you like. Give advice, but avoid boring cliches that are totally not surprising. Entertain by telling humorous anecdotes and vivid stories. Offer an account of an interesting or humorous incident. Express the feelings of the class. But do not go over the top. Wish the graduates of your class all the best and thank them for listening. Thank the parents and family. Have your class honor them with applause. Not only have they made sure you showed up to school, there’s a host of other responsibilities that parents have sacrificed to accomplish for you. Now is your moment to focus on them for a minute or so. Thank the teachers and administrators. Each teacher or professor works many long hours that you don’t see in the classroom, and many have poured their hearts and lives into teaching. Take this moment to make it worth it for them. Use some of my vote of thanks example expressions to feed you imagination for topics for graduation speech a little bit. When you decide to make your graduation speech personal, you will experience much bigger success. It will also be more fun to write and deliver a talk that brings high school or college to a close with recognition of the small things in education life. The memories you will run across looking through yearbooks and talking about with friends will be priceless for you as well. It is very intimidating to address hundreds of people in the audience while delivering a graduation speech. Many of us have fear of public speaking. Before you proceed, do this test. And practice the tips. Include stories about your school. These high school graduation speech topics can be about teachers and funny things that have happened over the year. Include motivational or moving events that may have happened – perhaps volunteer opportunities that have changed the students’ perspective. Make sure that any major events that have happened are recognized. Sports and music events that have been important to the school need to be recognized, even if it happened in one of the prior years of your class and not the graduating year. Bring the class experience alive for those attending the graduation. Grandparents and parents, as well as siblings, have heard the names from school. Bring the people to the campus life that they have heard about. If a fellow student or teacher has died, mention that person. Make it not a funeral obituary eulogy but recognize them for the family who might be present. Mention any projects that the school has undertaken; if you have been involved in a community garden or other volunteer organization give credit for the impact it has made. 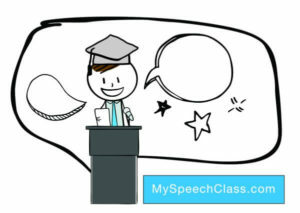 Cite this article as: Jim Peterson, "Graduation Speech [20 Examples + Template]," in My Speech Class, May 13, 2018, http://www.myspeechclass.com/graduation-speech.html.